Happy to be drawing again – it’s Thursday and time for an update on my drawing project. On the Lookout, #2 is graphite being drawn on Strathmore Bristol Vellum paper, the smooth side. Today was spent cleaning up the wood post adding in more wood grain and darkening/lightening areas that will make the post standout. 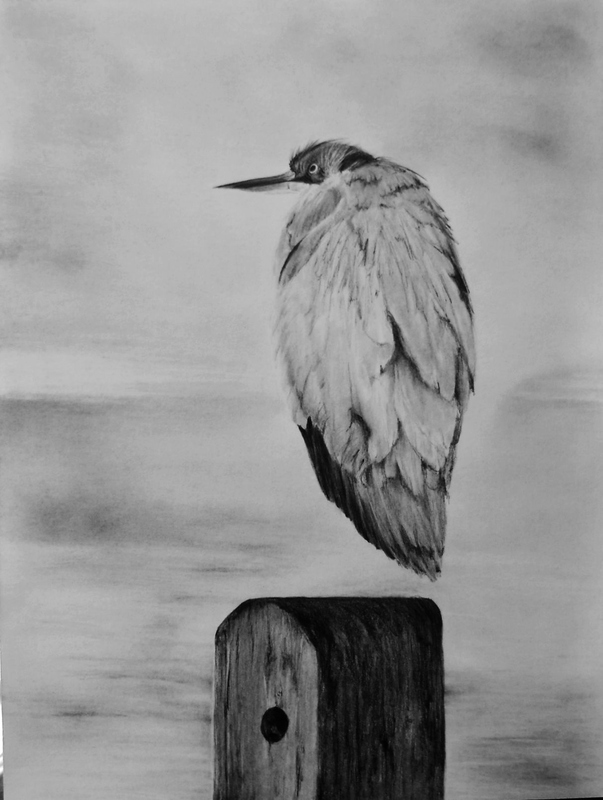 Also work began on the Heron, establishing its foundation using an HB pencil, then the head came next (I wanted to draw in the darkest parts of the bird to establish the darkest values in the scene [HB, 2B, 3B and 4B]). Finally using HB the foundation of the body/feathers were drawn with a variety of graphite pencil values and a tortilum was used to blend out the feathers. This was only an initial start to the feathers a lot more work needs to be done. A kneaded eraser was used to bring out the highlights in the feathers, and also a short camel haired brush used on the feathers to smooth out the feathers for a softer look. Next week the back will be expanded out to the right a bit more (to give a more fuller body and hunched look) and I’m hoping the feathers will be completed. Can’t forget the feet! Either next week or the week after final touch ups will be made, the lightest areas I’ll go over one last time and perhaps the darkest darks too. Thank you for checking in, have a wonderful weekend ~ click onto image for a larger view. Thank you Fabio, always appreciate it! The weekend was great – best wishes for a wonderful week ahead!! One of the most fascinating creatures, and you are doing him justice! Thanks Elena! They are gawky and elegant at the same time ~ quite the character. Thank you Pauline – the feathers are fun to work out. I’m glad his attitude comes through – he’s a tough one!! Thanks Jet so much – I really appreciate it. You would absolutely know the Heron stance, thanks for noticing. We have one that visits all the time and sits up in our Oak tree – patient, but always on the hunt. Beautifully executed so far! Can’t wait to see the finished piece. I love how you really developed the texture. Thanks Catherine, really appreciate it. I love drawing textures with graphite and charcoal – finding all those patterns and seeing if something can be made with them. Thanks for commenting on them. Thanks Heidi, glad you are enjoying the Heron – he is a lot of fun to paint. He looks quite fierce 🙂 Good for him! Hope you’re enjoying your weekend, Mary. Thanks Jo – I really wanted that fierce, hunting look, thanks for noticing! I really enjoyed the weekend and coming right up to the next and I’m fighting the clock on getting everything done. Hope to catch-up with everything over the next couple of days. Hope you are well! Herons make me laugh. They’re very beautiful and graceful when they fly, but when they’re perched on something, they’re almost goofy-looking. I think this drawing already has a lot of personality. Thanks so much – you know they are the oddest birds, but gorgeous as well. This one is a wonderful specimen that I really am having a ball drawing. Have a wonderful weekend. Wow…gorgeous…art in process! I am glad that you said something about the feet because I was wondering about that 🙂 Beautiful talent, Mary! Thank you Patrick – it’s an amazing bird to draw and reminds me of one that visits us often (in the same hunched perch too). Those feet, yeah I thought they would be one of the last things I draw – funny right? Thank you for your compliment – means a lot. Thanks Rita. I love this guy he is a lot of fun drawing, especially the feathers. Great Job Mary! Looks fantastic, the feathers are beautiful. Thanks so much Isabel – appreciate your kind feedback! You are so right Sylvia, thanks so much. I see this stance all the time with the one that sits high in our Oak tree. I love working on him, pleasurable to work those feathers. Have a beautiful weekend. Outstanding! You’ve captured the intensity of the bird so well through his eye and posture. This will be another in your long list of awesome graphite drawings! Love it Mary. Thanks so much Rhonda. I love working on this particular drawing – I’m forced to think about what I’m doing with the feathers and values, etc.. It’s hard not to just sit down and finish it ~ have a wonderful weekend. Coming along well, Mary. Grey heron haunt my riverside walks here in the UK. Such gawky, pre-historic looking birds. They let me approach quite close – close enough for a chat! But raise a camera and that’s it – off over the swell, flapping low, calling harshly, to resume their cruel vigil on the opposite bank. Might yours be a Great Blue? I look forward to the finished pic. I so agree with you Paul, thanks so much. We have one that sits high up in our old Oak tree and is very per-historic looking, as well as hunched like this character that I’m drawing. Mine is a Blue Heron and I’m having a great time working on it. Very lovely work Mary, lovely contrasting, great depth is building up and the details on the bird (feathers, eyes, beak) is wonderful (love the kinda not happy expression on the face) just as the woodgrain details on the box. It’s going to be a most beautiful piece. Hi Eva, thanks so much. This is such a rewarding piece of art to be working on – I get totally in the moment working on the feathers (that’s the analytic side coming out in me). It was hard to resist working on the Heron just a bit today – we have one that sits high up in our old Oak tree and has a hunched perch like this guy I’m drawing. Have a wonderful weekend. Feathers look good to me, Mary. 🙂 Look forward to seeing what you’ll do do them next time. Thanks Geralyn! Have a great weekend. It looks so cool w/o feet.. like a fantasy story for kids.. a different world. Thanks so much Resa, oh yeah those feet – well they’ll be coming. Cool! Just a note/question… When first I saw your reply about the feet coming, I was using my annotator (little comments box in right hand corner.) There was a Poll Daddy link attached to your comment & it is still there. When I clicked it was reams of HTML. So, I came to your site & that Poll Daddy link is not here, attached to your comment. Was this something you attached by accident, then erased? OR if it is not, then I will report this ghost link to WP. I have had this on other comments as well. I’ve reported it to WP, and they are looking into it.They found it most interesting. Thanks very much Resa! Looking forward to seeing what they are able to do with it. If they do not reply, and the tagging link stops, they’ve done their job! Thanks Resa, it’s still popping up – a very weird thing. I see the popping up. Until we see no more popping …do not click on the link! Such subtle gray values in the feathers. Can sense the volume in the layers. Beautiful, Mary! Thanks a lot Tom! Really appreciate your artist eye – I need to work the values more so the highlights will show on the feathers, it looks like a couple more weeks before it’s done. Thanks Debi – it’s been a lot of fun working on this piece. Thanks Patricia – have a lovely weekend. Wonderful Mary! I especially love the feathers. wow it looks like a photo! Thanks so much Cindy and welcome home! This is like a beautiful bird photo. The details of the feather is incredibly beautiful. Thank you Amy – appreciate it! A bit more work to do on the feathers, but it’s coming along. Have a good weekend. Looks like Winston Churchill, if he’d had feathers and a beak, naturally. Something about the intensity of the look, I guess. Wow! If this was a photograph, it’d still be amazing! Woo! Yeah pretty much speechless! Yeah, Laura you’re pretty awesome – thanks my friend. Thanks Janet – it might take two more weeks, a lot of work to do on the feathers. Have a wonderful weekend. Thanks Cynthia – much appreciated!